I have people ask me all the time where to start to get certified in VMware. VMware is one of the few certs that you need to take a class to get certified at the professional level. Here is a good video that provides a good overview of the VCA certification. Each track has a free online fundamentals course that helps you prepare for the exam. Also, make sure you study the exam blue print for each track. It is the best study resource for the exam. Once you feel you are ready to take the exams you need to request authorization before taking the exam. Just go to each tracks page (links above) and click on the “Request Exam Authorization”. Once completed you can go to the Pearson Vue website and schedule the exam. One nice thing about the VCA exam is that it can be taken anywhere online. You do not have to go to a Pearson Vue test center to take the exam. There are many options to take these classes : Classroom, Live Online & On Demand. You can schedule them directly through VMware or you can go to a training provider like Global Knowledge or New Horizons Learning Centers. These are good options, but are the most expensive and usually the main reason why people don’t have the VCP certification. There is another option that a lot of people don’t know about and is much cheaper. Just like the Cisco Academy, VMware has the “IT Academy” program. Schools and colleges offer VMware classes that will qualify you to achieve the VCP certification. Here is a list of schools that are in the VMware IT academy program. Sometimes IT Academy classes are almost half the cost of the commercial offerings. I took my ICM class at an IT Academy. It took a little longer to complete the class than the commercial offerings, but in the end the result is the same. Just like the VCA exams, once you are ready to take the VCP exam you have to go to each tracks page and click on the “Request Exam Authorization”. Once completed you can go to the Pearson Vue website and schedule the exam. There is all type of study material for each tracks VCP exam, but the best thing to study is to study is the exam blue print. All of this information and more can be found on the VMware Certification page. This should be enough information to get you started with achieving a VMware certification. It makes no sense at all that VMware is adding expiration dates to certs that have version numbers. Cisco & Microsoft certs do not have versions, so it makes sense for them to have an expiration date. I have not seen a good explanation from the certification team why an expiration has been added. There has been so much discussion on the VMware Communities about the VCP5-DCV Delta Recertification Exam. Originally the exam was only going to be offered until Nov 30th 2014. Then VMware extended the exam to March 10th 2015. Not sure why VMware did this, but my personal opinion was not enough people were taking the exam, so VMware extended the end date to try to recoup costs of creating the exam. I think everyone has forgotten that the Delta exam is not your only option to re-certify your VCP5-DV. Pass the current exam for the VCP certification you currently hold. For example, a VCP3 could recertify by passing the current VCP5-Data Center Virtualization (VCP5-DCV) exam. Earn a new VCP certification in a different solution track. For example, a VCP-Cloud could recertify by earning a VCP-Desktop (VCP5-DT) certification. Advance to the next level by earning a VMware Certified Advanced Professional (VCAP) certification. For example, a VCP5-DCV could earn VCAP5-DCA certification. For current VCP5-DCV holders who took the VCP510, there is a limted-time, streamlined exam option just for you. This exam is only available through March 10, 2015 so act fast. You can check VMwares re-certification policy for all the official details. In my opinion the Delta exam is a waste of time and money. After taking the Delta exam, you are still only VCP5-DV. I decided to learn something new and take a VCP exam in a different track – VCP-NV. 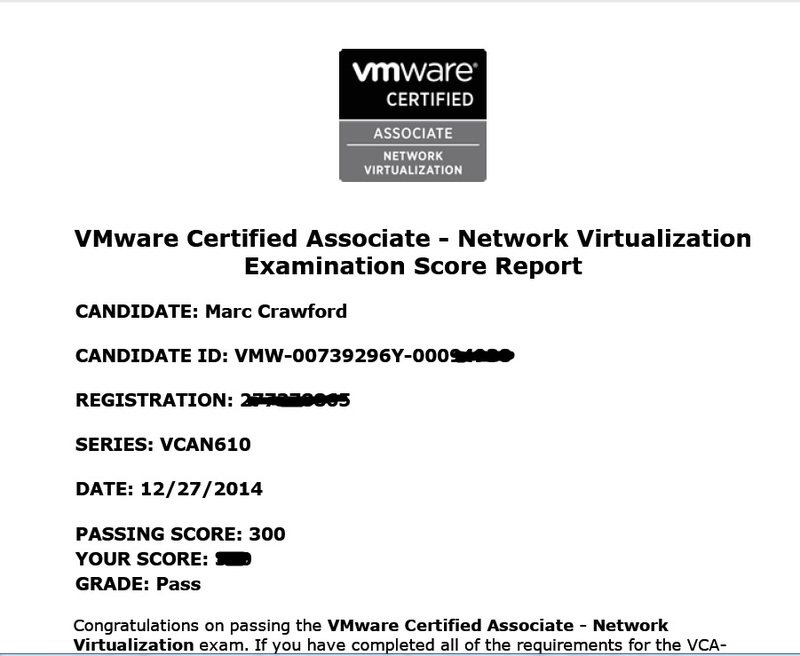 So last week I took and passed the VCP-NV exam. Don’t waste your time with the Delta exam. Push yourself to learn something new and take a VCP in a different track or take a VCAP exam! On 22 December VMware released the 4th VCA exam – VCA-NV . Since I already took and passed the other 3 VCA exams (VCA-Datacenter Virtualization, VCA-Workforce Mobility, VCA-Cloud), I decided to give this one a try. Back when the first 3 were released, there was a promotion that you could take them for free. That promotion has expired, so I had to use a voucher to pay for the exam. 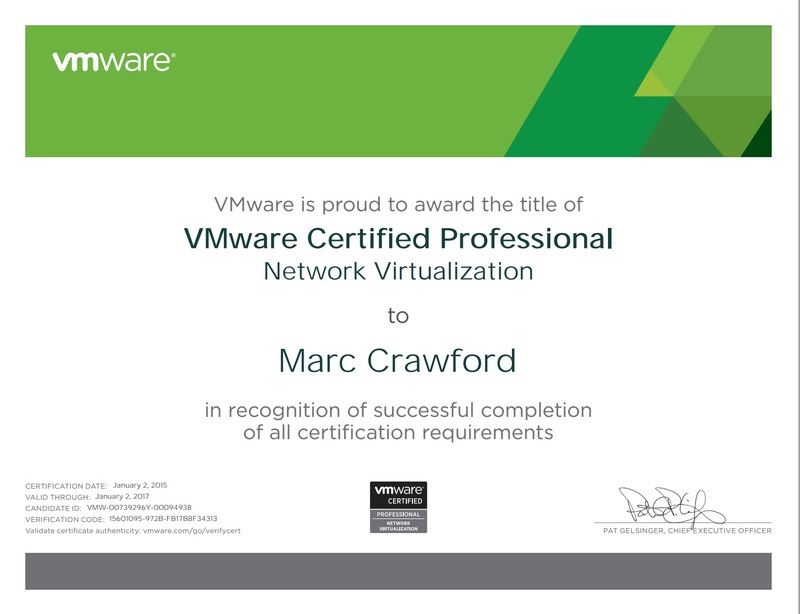 The first resource I used to study for the exam was the free elearning VMware Network Virtualization Fundamentals course. 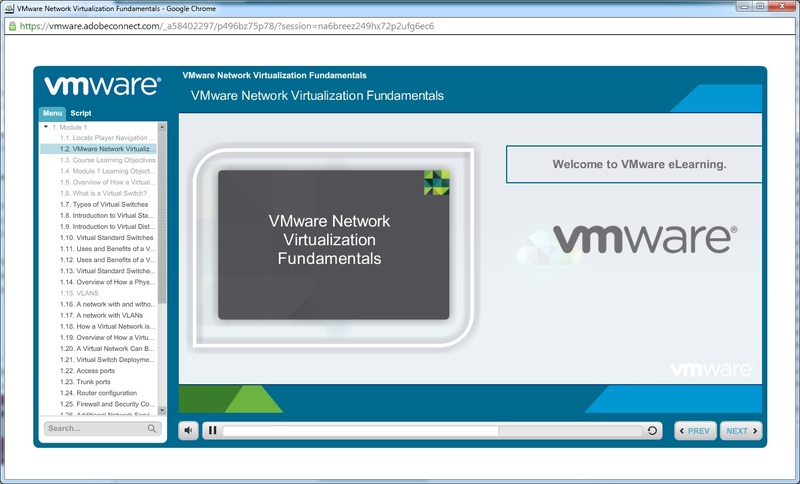 It is a FREE 3-hour self-paced course providing a fundamental overview of VMware’s network virtualization products. The second resource that I used to study for the exam was the exam blue print. This is always the best resource when studying for a VMware exam. Within the blueprint it references other documentation such as the NSX Admin guide. I downloaded all the documentation that was referenced in the exam blue print. I read the exam blue print word for word, but I did not read all the associated documentation word for word. I browsed through most of it and stopped at parts I did not understand. I already have my VCP5-DV, so I did not need to study the vSphere documentation that much. I spent a couple days watching the fundamentals course and looking through the blue print and associated documentation. Based on how I had studied for the previous 3 exams I thought a couple days was enough. Luckily the VCA (VMware Certified Associate) exams can be taken online. You can take them anytime you want. There is no need to find a test center and then find a time that is open. Just go to the Pearson Vue website to sign up for the exam. After you have signed up for the exam you can immediately take the exam. The VCA-NV exam consists of 50 questions and a short pre-exam survey consisting of 5 questions. The passing score for this exam is 300, using a scaled scoring method. The time limit for the exam is 75 minutes, with an additional 15 minutes to complete the survey questions and agreements. After completing the survey, I started the exam. The first couple questions were harder than I thought, but after I clicked end, I achieved the results I had hoped. I thought this exam was the toughest of the 4 VCA exams. That me be because I have very little experience and exposure to VMware NSX. I have CCNA Datacenter so I understand networking concepts very well. I have my VCP-DV so I understand vSphere concepts very well. You really need to have a good understanding of the NSX components and what there roles are, but you don’t need to know and understand every detail.